die and are then naturally metabolized by lymphatic system. impressive. After the first session, fat deposits are reduced by 25 percent. of fat a patient wants to lose. 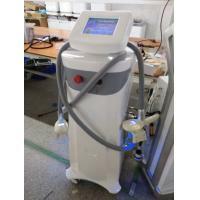 In the machine, a specially designed cooling applicator is applied to the desired area of fat reduction to extract energy (cooling) from the underlying fat tissue without damage to other tissues. The applicator cup uses a gentle vacuum pressure to draw the tissue between the cooling panels. During the procedure, the applicator delivers precisely controlled cooling conditions that have been proven to target and eliminate fat cells in specific areas of the body. 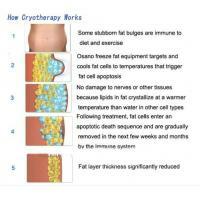 When fat cells are exposed to precise cooling, they trigger a process of natural removal that gradually reduces the thickness of the fat layer. 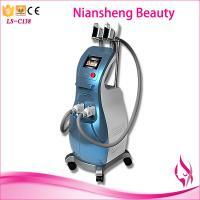 1).Body shaping,fat dissolving,repel the cellulite. 3).Decrease the excessive water and prevent the fat from accumulation. 5).Clear belly wrinkles,especially the stretch marks. For the triglyceride from the fat can transfer to the solid in the normal temperature,it send the the accurate the hypothermy wave to the dissolved part by noninvasive launcher, contrapose and eliminate the adipocyte. When adipocyte cooled,it will resolve naturally, made the fat deposit thin,after ,by the metastasis and lipolysis, it will achieve the part-dissolved fat. The cure is noninvasive, patient can move right away.such as work and exercise. The cured part maybe turn red and last for several minutes or hours,this part even will bruize,but after weeks, it will desappear. Most of the patients will feel confortable! During the clinical test,no one needs the narcosis or analgesic, normally,they can read freely, and they can work with the computer ,listen to music, relax themselves. 4.How long will the curative effect last ? On the patients who fat deposit slow the reaction, our experiments are turned out that curative effect can last on year at least. 5.what's the differents among others ? Advantage: it can take out much fat one time. asymmetric part, even make you died. Advantage: it can effect on the deep fat. Matters need attention: it will hurt the normal cells and make you felt painful. 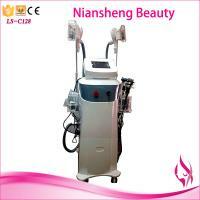 Matters need attention: you must the part of lipolysis accurately. After cure will red and swollen. It's a portable device, you can take it everywhere without too much carry. Latest product, brief but professional, attractive to everybody! Cooling head by cool wave works. 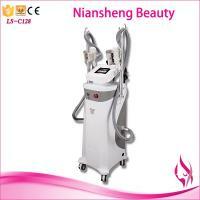 1.Body shaping,fat dissolving,repel the cellulite. 3.Decrease the excessive water and prevent the fat from accumulation. 5.Clear belly wrinkles,especially the stretch marks.